UPDATE: As of November 25, 2016, I have a video tutorial for this. The written post continues below. 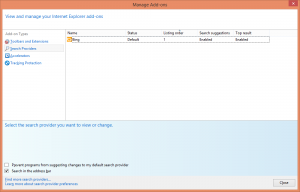 Internet Explorer has matured quite a bit since the release and subsequent infamy of its 6th version, IE6. Over the years, Microsoft has made many changes to the way the browser works, and overall, I’d say they’ve been successful in delivering a better browsing experience. However, they’ve also formalized certain parts of its configuration, and as a side-effect, it’s not always easy to make changes that are fairly straight-forward in one’s mind. 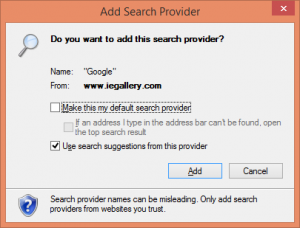 A good example of this is changing the default search engine that’s used by the address bar. Click on the gear icon to the top right in the main Internet Explorer window. At this point, you should see the list of installed search providers on the right. In my case, I only saw Bing. From this point on, depending on whether or not you see Google, the steps will be different. 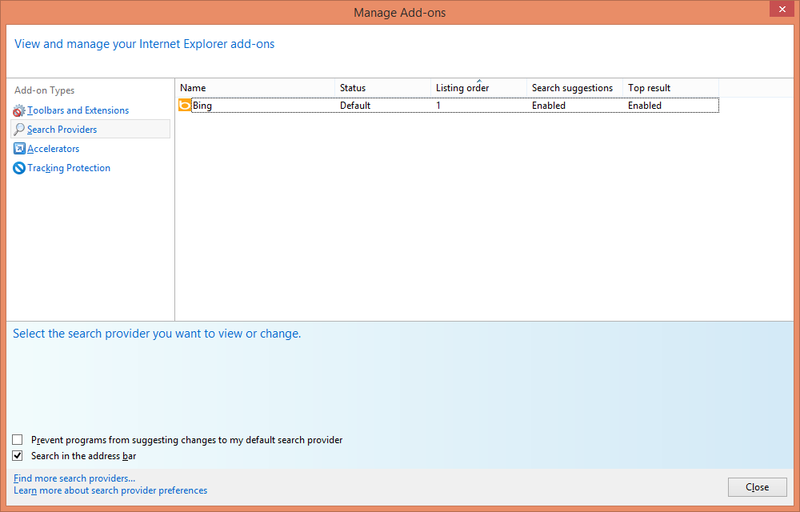 In the “Search Providers” section of the “Manage Add-ons” dialog, look for a link called “Find more search providers…” it should be to the bottom left. Click it. A website called the “Internet Explorer Gallery” should appear, and on it, you’ll see many popular search providers. Click on the title that represents Google. You should now see the page for the Google Search add-on, and on it, you’ll see a big “Add to Internet Explorer” button – click it. If you have the “Manage Add-ons” window open, close it. Google should now be your default search engine – try by typing in the address bar for a search term, and pressing Enter. And that’s all there is to it. It’s a bit more involved than it needs to be, especially if you don’t have Google in your list, but Microsoft has a way of formalizing things, in general. In terms of development, in my opinion, generalizing the concept of a “search provider” so that it’s a type of “add-on” is actually a healthy practice, I just feel they could have been done better from a user interface perspective.